"Pestle" redirects here. For words with a similar spelling, see Pestel (disambiguation). 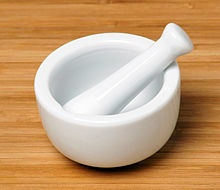 Mortar and pestle are implements used since ancient times to prepare ingredients or substances by crushing and grinding them into a fine paste or powder in the kitchen, medicine and pharmacy. The mortar (/ˈmɔːrtər/) is a bowl, typically made of hard wood, metal, ceramic, or hard stone, such as granite. The pestle (/ˈpɛstəl/) is a heavy and blunt club-shaped object. The substance to be ground, which may be wet or dry, is placed in the mortar, where the pestle is pressed and rotated onto it until the desired texture is achieved. Scientists have found ancient mortars and pestles that date back to approximately 35000 BC. The antiquity of these tools is well documented in early writing, such as the Egyptian Ebers Papyrus of ~1550 BC (the oldest preserved piece of medical literature) and the Old Testament (Numbers 11:8 and Proverbs 27:22). Mortars and pestles were traditionally used in pharmacies to crush various ingredients prior to preparing an extemporaneous prescription. The mortar and pestle, with the Rod of Asclepius, the Green Cross, and others, is one of the most pervasive symbols of pharmacology, along with the show globe. Mortars and pestles are also used as drug paraphernalia to grind up pills to speed up absorption when they are ingested, or in preparation for insufflation. To finely ground drugs, not available in liquid dosage form is used also, if patients need artificial nutrition such as parenteral nutrition or by nasogastric tube. Mortars are also used in cooking to prepare wet or oily ingredients such as guacamole, hummus and pesto (which derives its name from the pestle pounding), as well as grinding spices into powder. The molcajete, a version used by pre-Hispanic Mesoamerican cultures including the Aztec and Maya, stretching back several thousand years, is made of basalt and is used widely in Mexican cooking. Other Native American nations use mortars carved into the bedrock to grind acorns and other nuts. Many such depressions can be found in their territories. In Malay, it is known as batu lesung. Large stone mortars, with long (2–3 foot) wood pestles were used in West Asia to grind meat for a type of meatloaf, or kibbeh, as well as the hummus variety known as masabcha. In Indonesia and the Netherlands mortar is known as Cobek or Tjobek and pestle is known as Ulekan or Oelekan. It is often used to make fresh sambal, a spicy chili condiment, hence the sambal ulek/oelek denote its process using pestle. It is also used to grind peanut and other ingredients to make peanut sauce for gado-gado. Large mortars and pestles are commonly used in developing countries to husk and dehull grain. These are usually made of wood, and operated by one or more persons. Other materials used include stone, often marble or agate, wood (highly absorbent), bamboo, iron, steel, brass, and basalt. Mortar and pestle sets made from the wood of old grape vines have proved reliable for grinding salt and pepper at the dinner table. Uncooked rice is sometimes ground in mortars to clean them. This process must be repeated until the rice comes out completely white. Some stones, such as molcajete, need to be seasoned first before use. Metal mortars are kept lightly oiled. Bangkang Pinawa, ancient Philippines' mortar and pestle. ^ "PHARMACEUTICAL SYMBOLS". STUDYLIB. MUSEUM OF THE ROYAL PHARMACEUTICAL SOCIETY. Retrieved 28 March 2019. ^ Sukphisit, Suthon (2019-03-24). "The enduring symbol of Thai cuisine". Bangkok Post (B. Magazine). Retrieved 2019-03-24. ^ "The Mortar and Pestle in Thai Cuisine". Temple of Thai. Retrieved 3 December 2016. ^ "Kitchen Essentials for Southeast Asian Cooking Basic tools and equipment for cooking Southeast Asian food". about food. Section 2. Mortar and Pestle to Make the Best Spice Pastes. Retrieved 3 December 2016. ^ Retsch: Size reduction with mortar grinders and disc mills[permanent dead link]. Rose Scientific Ltd. Retrieved 2009-10-21.